Every year since 2003, the stunning Island of Malta has held a Pyro-musical event which brings together both the local firework factories and international display companies for the entertainment of the masses. Fireworks, in general, are a year around pastime over in Malta and they love em. Whether the usual Maltese Shells (which are expertly hand made and specially created shells) or the Nar tal-Art (mechanized ground firework festival). There are 35 firework factories on the Island which are all fiercely competitive but due to the large numbers covering such a small area and given that almost every old householder there is also involved in the production of pyrotechnics in some way, sadly, this does also give rise to an increase in the number of firework-related incidents on the island. The factories each have their own professional team involved in both the mechanical firework competition and the International Pyro-musical Competitions held annually. The Feast days or ‘Festi’ have always been celebrations around the numerous Saint’s days and are a true spectacle and were originally musket fire and cannon shot referred to as ‘Feu de Joie’ (fire of joy) which were used for the birth of a new Royal Baby, the election of a new Pope or indeed the election of a new Grand Master of the Order of Knights. Last year, the competition was won by the USA represented by Rozzi Fireworks who picked up the Gold Award. Rozzi was founded in 1895 by the great grandfather of the current director of the company who emigrated to the USA from Italy. Rozzi was one of the original companies to choreograph pyro and music together and today, create spectacular displays for everything from small community events to full-on spectacles for hundreds of thousands of spectators. Local team St Mary’s Ghaxaq received the first runner up and the team from Phoenix Fireworks in the UK lifted the second runner up award. They were all incredible, but I have to say the specialist shells used in the display from St Mary’s were just stunning. We will bring you more information about the competition entrants once it is made available. COST: ADMISSION PRICES ADULTS 25 AED £6.00) / CHILD 6-12 YEARS 20 AED (£5.00)/ FAMILY TICKETS ARE AVAILABLE/ SEPARATE CHARGES APPLY TO SPECIALTY EVENTS. The mother of the nation pays a tribute to the living legacy of the original “mother of the nation” HH Sheikha Fatima bint Mubarak. A keen supporter of women’s rights in the UAE and the chairwoman of the family development foundation, general women’s union and president of the supreme council of motherhood and childhood. The 4th edition of the festival brings over a kilometer of entertainment, live performances, activities, and workshops for all the family to enjoy. Along with a variety of culinary experiences and 40 shopping outlets over the 12 days. The celebration this year is also in conjunction with the special Olympics world games due to take place in the middle east and north Africa for the very first time. From the 14th to the 21st of March over 7,500 athletes from 192 countries will compete to try and take home as many medals as they can. With different zones dotted along the corniche there is plenty to see and do for everyone. Happiness zone – packed with fun activities and programmes created to form deeper bonds with family and friends. Progress zone – science, art and technology where creative and innovative are taken to the next level, the future starts here in this zone. Sou Q / F&B zone – shop till you drop in the array of unique retail shops and stalls, sample some of the multicultural food on offer or stay and watch one of the superstar-filled concerts on stage. Special Olympics Zone – this is an additional zone this year for the largest sports event in the world taking place in the UAE. Focussing on the empowerment and determination of the athletes, many with intellectual disabilities taking place in several venues across Abu Dhabi and Dubai. Another first of its kind to be held on the mother of the nation festival, and of course our favourite part will be the fireworks competition. Handpicked teams from Canada, Australia, Netherlands, and South Korea will show off their pyrotechnic abilities before an expert panel of judges and battling out to get their hands on the inaugural winner’s trophy. Over the two action packed weekends the pyro will be launched from offshore barges at the Corniche Beach. Be amazed as the skies above will be lit for 15 minutes with a kaleidoscope of colours and breath-taking scenes as a combined total of 87,102 shells over the course of the eight displays, spanning over 360 metres. This is not one to be missed and will end your evening with a bang. 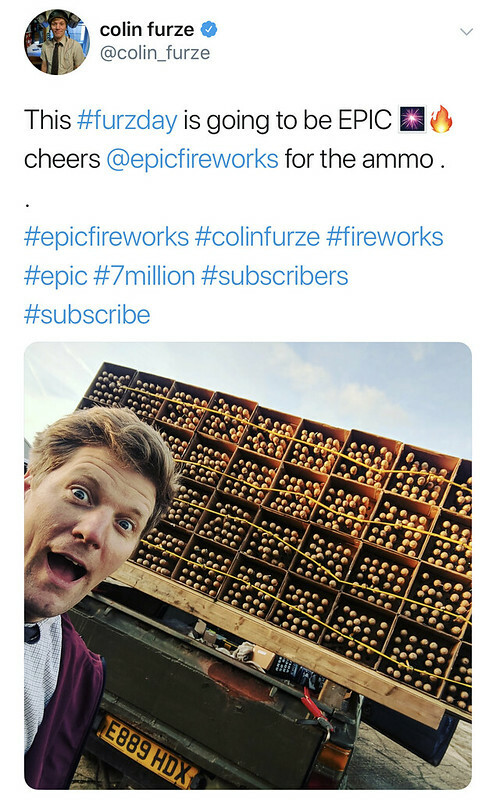 So, TOP MAN Colin Furze reached a cool 7 million youtube subscribers and decided to have a blast.